After winning a Bronze Lion award at the Cannes Festival of Creativity earlier this year, the Novartis ViaOpta Daily smartphone application also won a Silver Trophy at the IAB MIXX AWARDS 2015 in the Branded Utility category. Studio Binär managed the award competition entries for both the Cannes Lions and the IAB MIXX for Novartis and the app developer ARworks. The entries included various supporting materials ranging from case stories through long and short case films to presentation boards. Etwa 5,5 Milliarden Euro. Diese Summe verlieren Werber weltweit im Jahr 2015 durch so genannte Botnets. Das zeigt eine Studie, die die Association of National Advertisers erhoben hat. Botnets sind Netzwerke von Computern, die ohne das Wissen der Nutzer gesteuert werden und meist kriminellen Zwecken dienen. Mittlerweile gibt es verschiedene Unternehmen, die Lösungen gegen Ad Fraud anbieten. Dazu gehört auch enbrite.ly. Die Verantwortlichen wollen mit einer Genauigkeit von fast 100 Prozent “Menschen im Internet finden”. Der Dienst verfolgt Traffic-Quellen und zeigt so versteckte Werbebetrugsaktivitäten auf. Das ehrgeizige Ziel: Vollständige Transparenz in der Online Werbung. 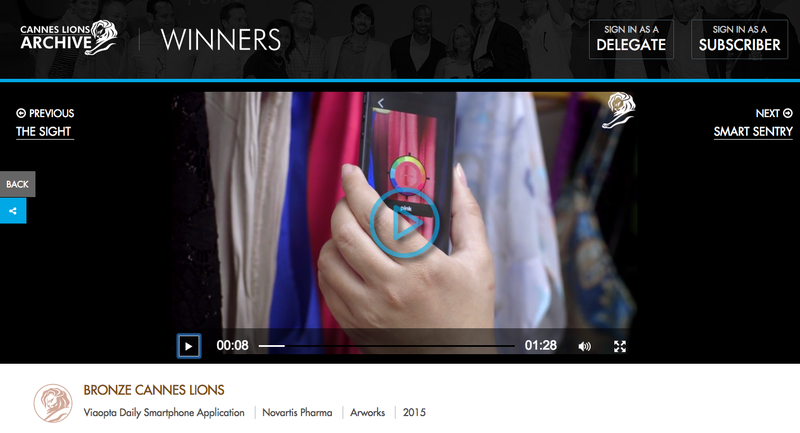 Besides the Bronze Lion we won with our clients, Novartis ViaOpta and mobile app developer ARworks, we are happy to release the news that both of our entries got on the short list at the Lions Health in the category Pharma/Education&Services. Studio Binär carried out extensive market research on behalf of the developer ARworks and managed the award competition entries for both the Cannes Lions and the Lions Health. The entries included various supporting materials ranging from case stories through long and short case films to presentation boards. Mobile application and AR technology developer ARworks teamed up with Studio Binär to take the ViaOptaDaily mobile application to the highly acclaimed Cannes Lions and Lions Health festivals. Our efforts were awarded with a Bronze Lion in the category Mobile Application/Services at the Cannes International Festival of Creativity. The WHO estimates that worldwide 285million people are visually impaired of which 39million are completely blind. The ViaOpta global initiative demonstrates Novartis Pharmaceuticals’ commitment to vision health by providing practical support to visually impaired people to better understand and manage their condition. 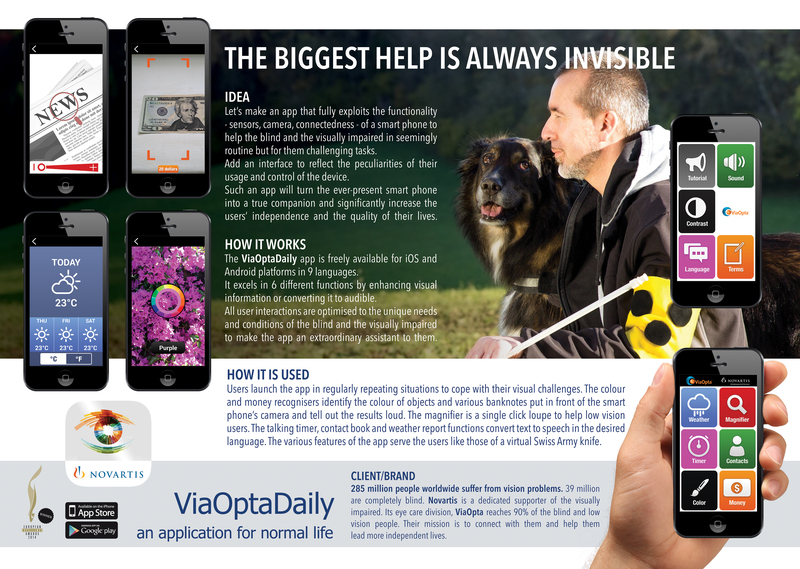 The ViaOptaDaily personal multi-function application project was launched by Novartis in 2014. The first version was released within the year for both iOS and Android operating systems. Since then extensive testing of the app has been done by hundreds of users to elevate phase 2 of the development and support the release of even more innovative versions of the app in 2015. Specialising in revealing hidden fraud in digital advertising, award-winning enbrite.ly recently closed a €750,000 funding round with Austrian VC fund SpeedInvest. A new partnership between enbrite.ly and the Vienna-based business development agency Studio Binär significantly extends the reach for new clients in the DACH and CEE markets. enbrite.ly (www.enbrite.ly), an innovative anti-fraud solution provider for the digital advertising industry has recently closed a €750,000 funding round with the venture capital fund Speedinvest (www.speedinvest.com) based in Vienna and Silicon Valley. 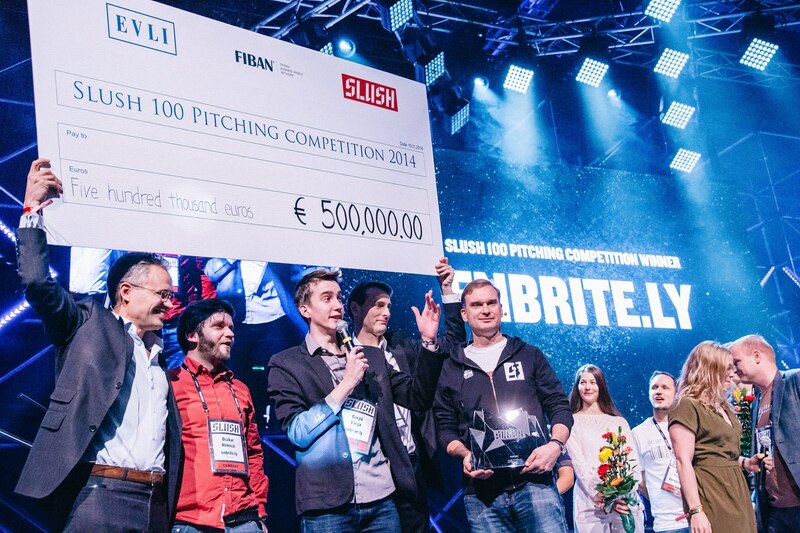 The investment that also involved Evli Bank (www.evli.com) from Finland and Enbritely Holdings, a consortium of angel investors, followed enbrite.ly’s victory at the Slush Prize (www.slush.org) in Helsinki last November. Mobile application and AR technology developer ARworks teamed up with Studio Binär to take the ViaOptaDaily and ViaOpta Nav mobile applications to the highly acclaimed Cannes Lions and Lions Health competitions. The ViaOptaDaily personal multi-function application and the ViaOpta Nav personal navigation application projects were launched by Novartis in 2014. The first versions were released within the year for both iOS and Android operating systems. Since then extensive testing of the apps has been done by hundreds of users to elevate phase 2 of the development and support the release of even more innovative versions of the apps in 2015. IAB Austria is partnering with USTREAM, the developer of the world’s leading video streaming technology platform and local service partner Studio Binär to provide exclusive live broadcast of the 2014 webAD Gala. As a new member of IAB Austria, we are proud to support one of Europe’s most prestigious digital advertising events and make it accessible to viewers in and outside Austria. For the 12th time in a row, the IAB Austria (Internet Advertising Bureau) presents the Best Digital Campaigns of the Year. The IAB webAD Winners’ Gala, a special highlight of the Austrian advertising scene, will be held in the Bank Austria Halle Gasometer on September 18, 2014.